A motto is a short sentence or phrase used to formally summarize or encapsulate the beliefs, motivations, intentions or ideals of an individual, group or institution. Often the motto can become a rule by which someone lives her or his life. Although a motto can be in any language, Latin is the one mostly used in the Western world. 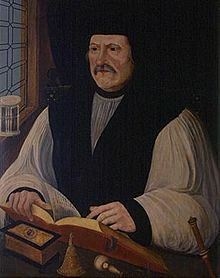 William Camden, an Officer of Arms under Queen Elizabeth who wrote a history of her reign at the suggestion of Lord Burghley, William Cecil, has become an excellent source for emblems and heraldic arms of the Tudor era although he does not always quote the motto nor offer explanations (Daly 5). Camden has given his ideal of a motto accompanying heraldry. He assures us that the picture is the body “and the Motto, which as the soul giveth it life. That is, the body must be of fair representation, and the word in some different language, witty, short, and answerable thereunto; neither too obscure, nor too plain, and most commended when it is an Hemistich, or parcel of a verse” (Camden Remaines 366-367). An official definition of motto is as follows: “A sentence added to a device (Ital. –L) L. muttium, mutter, a grunt, a muttered sound; cf. mutire, muttire, to mutter, mumble” (Skeat 387). Therefore, in heraldry, a motto is shown on a shield as part of a coat of arms. In English heraldry in particular, the motto is not granted with the armorial bearings and can be changed. Members of Tudor upper society certainly embraced the custom of using mottoes and “subjects adopted them as expressions of loyalty” (Cannon 253). Below are briefly the mottoes of Henry VIII, his wives and his children with expanded explanations on the mottoes of Elizabeth and her mother, Anne Boleyn to follow. Royal British mottoes can be a bit confusing. All Knights of the Garter may use the motto, Honi soit qui mal y pense, [Shamed be he who thinks evil of it] added to their heraldry. Also, the sovereign will use, Dieu et mon droit, [God and my right] on a scroll beneath the shield of the royal coat of arms. This motto has been attributed to Richard I Lionheart as a battle cry and has been used officially since the time of Henry V. Obviously, this refers to the monarchs’ divine right to rule. Clock given to Anne Boleyn by Henry VIII at the time of their marriage. The weights are engraved with the initials ‘H’ and ‘A’ and also the mottoes “Dieu et Mon Droit” and “The Most Happy”. Alternatively, the Royal Arms may depict a monarch’s or consort’s personal motto and may appear on many buildings, possessions, documents, and in more modern times on products—those purveyors who have earned the Royal Warrant. More on that topic in another blog entry. Often its use is done for dynastic glorification as illustrated in the cup Henry VIII commissioned by Hans Holbein as a wedding gift to Jane Seymour. Jane’s motto “Bound to obey and serve” is repeated on the lid and on the base. The bridal pair’s initials adorned the cup. “Its submissive tone was fairly typical for queen consorts, but it also reflects Jane’s personality and helps explain why she was so attractive to Henry” (Doran Man & Monarch 189). 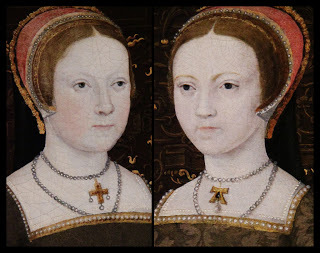 Reigning between queens with mottoes conveying humility and obedience-Katherine of Aragon’s “Humble and loyal” and Jane’s “Bound to obey and serve”-comes Anne Boleyn whose motto was the bold “The most happy”. Anne adopted this motto as her coronation approached. She had reason to be “the moost happi”: she had married a supportive and affectionate Henry, she was expecting his child (convinced it was the longed-for male heir), and she had managed to institute several religious changes in the country. Although some sources attribute the motto “Me and mine” to Anne, this blogger never found true evidence of it. 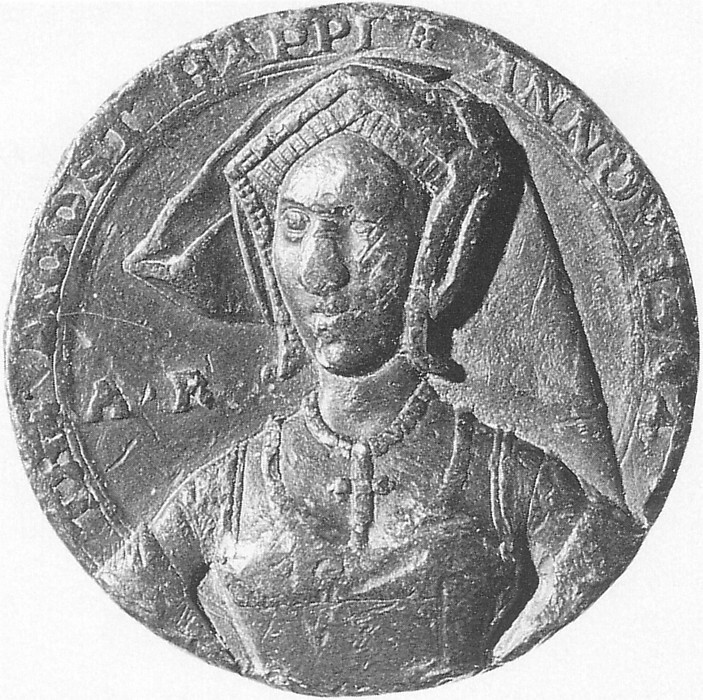 One motto she adopted in 1530 before she was queen, Aisi sera groigne qui groigne meaning “Let them grumble; that is how it is going to be!” (Ives 141). This motto had quite a story attached to it. Paul Friedman was quoting Pascual de Gayangos’ Calendar of State Papers, Spain Vol. 4, Part 2, page 41, which stated that Anne, to show her “contempt for those who opposed her, chose a device which she had heard in France, but which she only partially remembered, Ainsi sera, groigne qui groign! was embroidered on the liveries of her servants” (Friedman 128). Her arrogance and defiance did not last long. 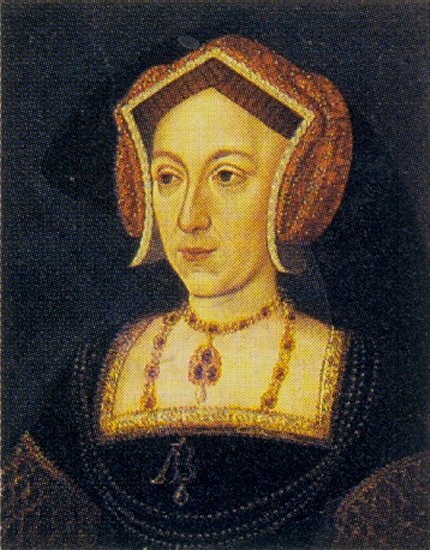 To her mortification, and to Eustace Chapuys’ glee, she learned that she had “adopted the motto of her bitter enemies, the princes of the house of Burgundy. ‘Groigne qui groigne’, she heard it repeated, “et vive Bourgoigne!’ The liveries had to be laid aside, and Anne’s servants on Christmas Day appeared in their old doublets” (Friedman 128). Such a blatant alteration of an Imperialist motto was hardly the way to win supporters at Court and gain Anne acceptance as the replacement of a highly-respected Habsburg queen (Ives 142-143). 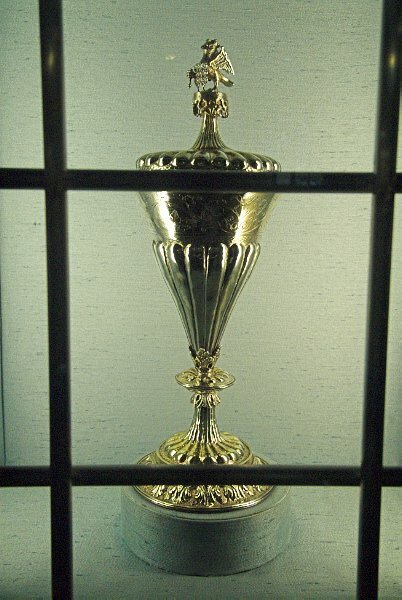 The Boleyn cup 1535-36 in St. John the Baptist Church in Cirencester with motto “The Most Happy.” Elizabeth inherited this beautiful from her mother and in turn gave it to her physician Richard Master who presented it to the church. Another motto, Semper eadem, [Always the same], was said to be used by Anne (Weir 324). This blogger could not find primary source evidence to support Anne’s use of this maxim. It was a well-known motto adopted by Anne’s daughter, Elizabeth, when she became queen. This particular motto appears to be associated with the quality of constancy. 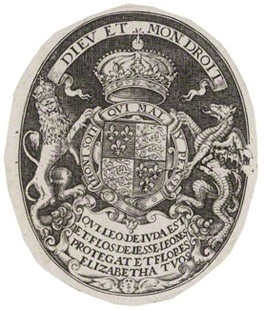 Elizabeth’s constancy can be shown in her willingness to maintain a steadfast government during the transition between her reign and her sister’s. See the blog entry https://elizregina.com/2013/04/09/reigned-with-your-loves/ for a list of Marian councilors retained by Elizabeth. Perhaps Elizabeth adopted it for simply sentimental reasons to form a link to her mother. Another view of this motto reveals it to be a pledge that Elizabeth would not change her religious faith (Collinson 1549). 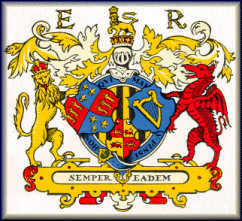 Coat of Arms of Elizabeth Regina with motto, Semper eadem. With the childhood fraught with uncertainty and constant change perhaps this motto was a rule in which Elizabeth preferred to live. It does imply an avoidance of any surprise, uncertainty or disruption. Could a sovereign associated with such changes that supported exploration, encouraged the Arts and introduced religious reform prefer the status quo? 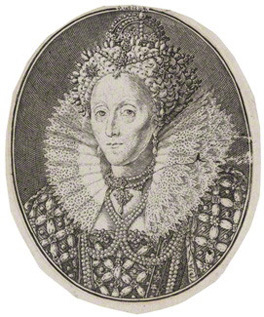 William Camden deemed Elizabeth’s main care upholding the Protestant faith and her “second care was, to hold an even course in her whole life, and all her actions: whereupon she tooke for her Motto, Semper eadem, that is, Alwayes the same. The rest of her counsels consisted in these points” (Camden Annales 20). There is some disconnect between this motto and her well-known impulsiveness, indecision and secrecy. Elizabeth’s habit of covering her actions and motives was admired by Camden. When explaining her second motto, Camden discussed her methods “Which notwithstanding Queene Elizabeth dissembled and concealed with silence, according to that motto which she used, video et taceo, that is, I see and say nothing” (Camden Annales 307). “I see and say nothing” has been termed a political motto used by Elizabeth. With her impressive humanist education, this motto could be of ancient historical significance or it could be a practical methodology employed by Elizabeth. No sources that this blogger has discovered definitively explain Elizabeth’s selection of this motto. 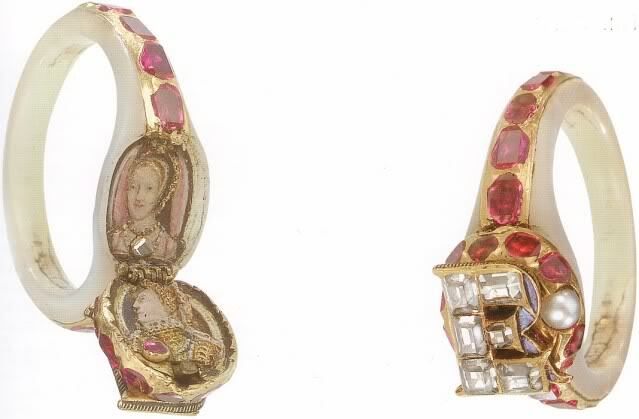 An examination of them suggests a link to the equation of Elizabeth’s style with Cicero’s, an acquired maxim from Lady Tyrwhitt, a reflection of her moderate religious policy or a connection to Francis Walsingham’s spy network. More recent authors have interpreted that the use of Elizabeth’s mottoes, Video et taceo, and Semper eadem “alludes to an important feature of prudence, which is that it encompasses the knowledge of when to speak and when to keep quiet” (Broad 34). 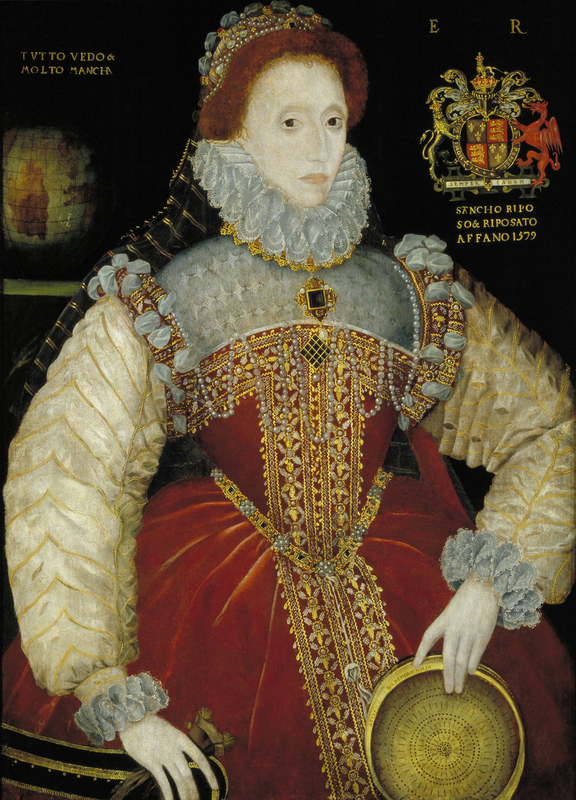 The Plimpton “Sieve” Portrait of Elizabeth I, by George Gower, 1579. The sieve alludes to the myth of Tuccia, a roman Vestal Virgin who proved her virginity and prudence by carrying water with a sieve. The coat of arms and the motto in the top right Honi soit qui mal y pense / Semper eadem [Shamed be he who thinks evil of it / Always the same] are the motto of the Order of the Garter and the personal motto of Elizabeth Regina. What does come to mind to this blogger is the ‘Rainbow’ portrait of Elizabeth with the eyes and ears embroidered on her gown. The poet John Davies refers to the ears and eyes as how the Queen uses her servants for a sketch he wrote during the Queen’s visit to William Cecil’s house, Theobalds, in 1591. When asked what use Elizabeth makes of her servants the reply was “She makes the same use of them as the mynde makes of the sences. Many things she sees and heares through them; but the judgment and election is her owne” (Nichols 77). Elizabeth clarified her right to rule and have good counsel early in her reign, “I shall desire you all, my lords, (chiefly you the nobility, everyone in his degree and power) to be assistant to me that I, with my ruling, and you with your service, may make a good account to Almighty God and leave some comfort to our posterity on earth. I mean to direct all my actions by good advice and councel” (Marcus 52). Through further research I discovered this idea of Elizabeth’s relationship with her advisors and her motto was further explored by Mary Thomas Crane. The “Rainbow” portrait attributed to Marcus Gheeraerts the Younger, 1600-1603. Professor Crane begins her article “Although one of her mottoes, ‘semper eadem,’ seems to claim a fundamental unity of character, Queen Elizabeth I nevertheless presents us with an array of poses and personae” (Crane 1). How true. Students of Elizabeth Regina are familiar with her paradoxically presenting an image of absolute patriarchal power and one of a ‘weak and feeble woman’. How did Elizabeth maneuver within the Privy Council composed of men whose views were the by-products of a time period when authority and advice-giving were the realm of males? This was an era that considered “Kings were creatures defined by ancient custom; but queens, however loved and admired, were unpredictable” (Loades 318). The use of the term ‘video’ assures that Elizabeth will listen and evaluate the advice to make up her own mind, as opposed to ‘audio’ that implies she will “accept blindly her advisors’ spoken counsel” (Crane 2). In an era when women were to remain silent and obedient, ‘taceo’ insinuates that “as queen, she will maintain the silence thought suitable for a woman …” (Crane 2). The motto encapsulates the fine line Elizabeth struck between asserting her authority and accepting advice from her Council. She could be silent and allow her statesmen such as Burghley the role of respected advisor and she could be vocal and affirm her authority. Crane sees Elizabeth’s motto, Video et taceo, as more of the way she uses the political system and her “use of the paradigm of advice-giving reveals a woman who was less completely bound by male structures than some critics have argued” (Crane 2). Elizabeth “despite her motto, did not always remain silent…. Her skillful use of the humanist rhetoric of authoritative counsel allowed her to break silence and speak the language of authority as a uniquely powerful woman in a man’s world” (Crane 12). Allison, Ronald and Sarah Riddell, editors. The Royal Encyclopedia. London: Macmillian Press, 1991. Print. “Arms of Tudors; Arms of Henry VIII; Arms of Edward VI.” Victoria and Albert Museum Collections. 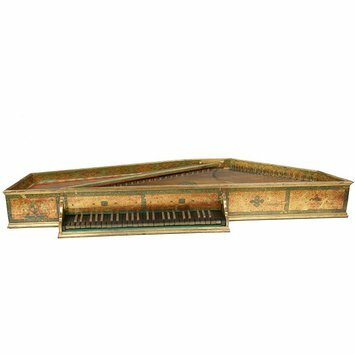 Victoria and Albert Museum, n.d. Web. 17 June 2013. Broad, Jacqueline and Karen Green. Virtue, Liberty, and Toleration: Political Ideas of European Women, 1400-1800. Dordrecht, The Netherlands: Springer, 2007. Google Books. Web 21 Jun 2013. Camden, William, Robert Norton, Nicholas Hillard, and Francis Delaram. Annales or the History of the Most Renowned and Victorious Princesse Elizabeth Late Queen of England, Containing All the Important and Remarkable Passages of State, Both at Home and Abroad, during Her Long Ans Prosperous Reigne. Trans. R. N. Gent. 3rd ed. London: Harper, 1635. Google Books. Web. 21 June 2013. Camden, William. Remaines concerning Brittaine: But Especially England, and the Inhabitants Thereof: Their Languages, Names, Syrnames, Allusions, Anagrammes, Armories, Moneys, Empresses, Apparell, Artillerie, Wise Speeches, Prouerbes, Poesies, Epitaphs. London,: Simon Waterson, 1605. Google Books. Web. 21 June 2013. Cannon, John and Ralph Griffiths. The Oxford Illustrated History of the British Monarchy. Oxford: Oxford University Press, 1988. Print. Collinson, Patrick. 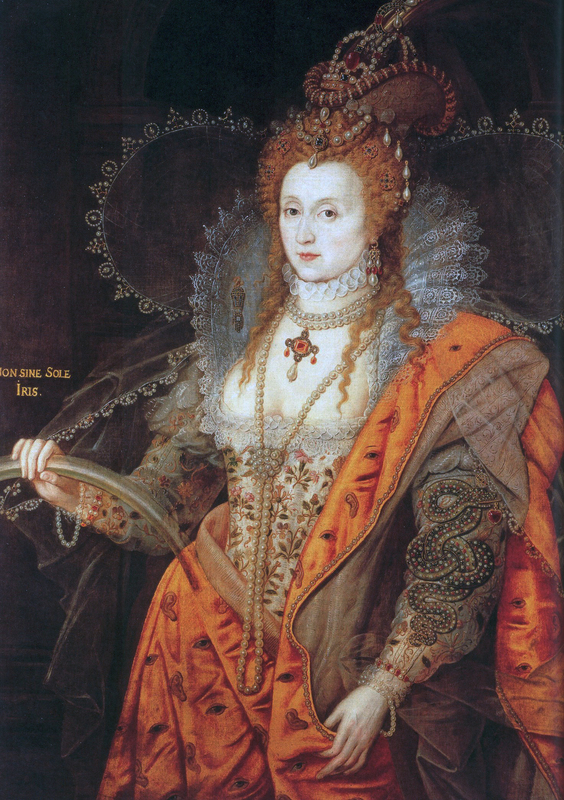 Elizabeth I. Oxford: Oxford University Press, 2007. Google Books. Web. 16 June 2013. Crane, Mary Thomas. “Video Et Taceo”: Elizabeth I and the Rhetoric of Counsel.” Studies in English Literature 1500-1900 28.1 (1988): 1-15. GeoCities, 2001. Web. 20 June 2013. Daly, Peter, Leslie Duer, Anthony Raspa. The English emblem tradition. Toronto: University of Toronto Press, 1998. Google Books. Web. 21 June 2013. “Death Could Not Separate Them: How Elizabeth I Connected to Her Deceased Mother.” Web log comment. Being Bess. Ed. Ashlie Jensen. N.p., 5 Aug. 2012. Web. 20 June 2013. Eakins, Laura. 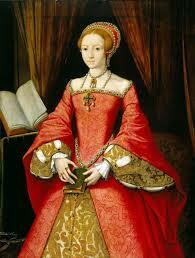 “Elizabeth I’s other motto.” TudorHistory. Google+Page, 20 Feb. 2012. Web. 17 June 2013. Eakins, Laura. 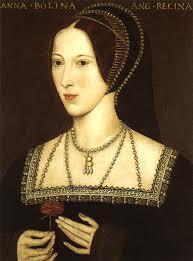 “Meaning of Anne Boleyn’s motto.” TudorHistory. Google+Page, 31 Dec. 2009. Web. 19 June 2013. Friedmann, Paul. 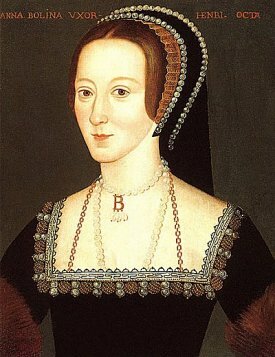 Anne Boleyn: A Chapter of English History 1527-1536. London: Macmillian and Co., 1884. Internet Archive. Web. 21 Jun 2013.
de Gayangos, Pascual (editor). “Spain: January 1531, 21-31.” Calendar of State Papers, Spain, Volume 4 Part 2: 1531-1533 (1882): 31-47. British History Online. Web. 22 June 2013. Isaacs, Alan and Jennifer Monk, editors. The Illustrated Dictionary of British Heritage. London: Promotional reprint Company, 1993. Print. Skeat, Walter W. An etymological dictionary of the English language. Oxford: Clarendon Press, 1993. Print. Loades, D. M. Elizabeth I. London: Palgrave Macmillilan, 2003. Google Books. Web. 16 June 2013. “Medallion: Arms of Henry VIII and Jane Seymour” Victoria and Albert Museum Collections. Victoria and Albert Museum, n.d. Web. 17 June 2013. Nichols, John. The Progresses and Public Processions of Queen Elizabeth. Among Which Are Interspersed Other Solemnities, Public Expenditures, and Remarkable Events during the Reign of That Illustrious Princess. Collected from Original MSS., Scarce Pamphlets, Corporation Records, Parochial Registers, &c., &c.: Illustrated with Historical Notes. New York: B. Franklin, Vol 3, 1823. Google Books. Web. 19 Jan. 2013. Starkey, David. 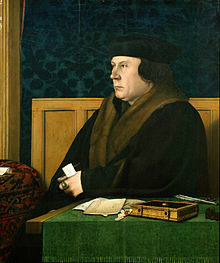 Henry VIII: A European Court in England. New York: Cross River Press, 1991. Print. 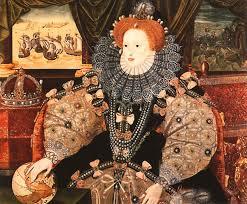 Strong, Roy C. Gloriana: The Portraits of Queen Elizabeth I. London: Pimlico, 2003. Print. Wagner, John. Historical Dictionary of the Elizabethan World: Britain, Ireland, Europe, and America. New York: Checkmark Books, 2002. Print.